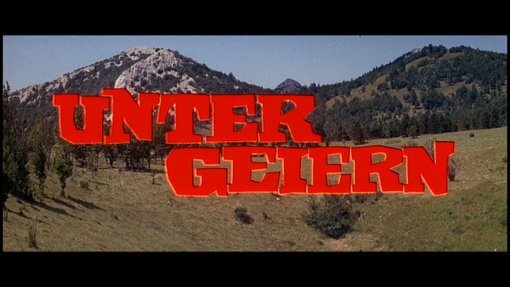 The first of the Old Surhand Karl May Westerns, with Stewart Granger and Terence Hill. UFA German R0 boxset disc. The fourth of Rialto Studio's Karl May Westerns, Under Vultures is the first of three films starring Old Surehand instead of Old Shatterhand. Although their earlier FSK-6 (similar to a PG rating) rated films had proven popular, the studio decided to add some diversity with this parallel series of more mature films rated FSK-12 (similar to a UK 12 or US PG-13 rating). Accordingly, Under Vultures is more western than adventure film, and darker on tone than its predecessors - the opening murder of Baumann's wife and young daughter is quite shocking (although not shown onscreen) - although the later films in the series would be darker still and there are still some elements of the youthful adventure stories in here (at one point Surehand is set a classic life or death challenge by the Indian tribe). The film builds up to a suitably interesting and dramatic climax, although there are a few unanswered questions and a few continuity problems - an interesting sequence in "The Valley of Death" is rushed through far too quickly, and there are a few lighter comic scenes that distract from the tone of the film. Direction from Alfred Vohrer, who also directed Old Surehand (1965) and the later Old Firehand (1966), is strong - emphasising the action scenes, while keeping the dialogue sequences interesting and keeping the plot moving with some impressive special effects set-pieces, although there are several scenes let down by obvious day-for-night effects and the background music is rather unoriginal for this series. Pierre Brice plays Winnetou again, and this time he is joined by Stewart Granger - a relatively major Hollywood player in the early 1960s, he was forced out by the influence of his ex-wife and came to Europe. Although hardly the Old Surehand of the books (a big, long brown haired man) he gives the role a good shot and comes off well - notably he seems much more fallible and human than Lex Barker's often larger-than-life portrayal of Old Shatterhand, fitting, considering the more realistic tone of this film. The attractive Elke Sommer looks very good in her role as Annie, while series regular Götz George looks good as Martin, once more saving his woman from kidnappers. Occasional American Western actor Walter Barnes plays Baumann Sr. with some good authority, while future Spaghetti Western star Terence Hill (credited as Mario Girotti) gets a small role as a settler later on in the film. Under Vultures is an interesting attempt to do something new with the Karl May series, and it should appeal to fans of the Classic Westerns, although it lacks most of the adventure elements that make the Winnetou series so fun, or the grit of the later entries. Still, it comes recommended, especially to fans of the series. Elke Sommer - a German actress, best known to cult fans for her roles in two of Mario Bava's horrors. Directed by anyone interesting? Alfred Vohrer - a lesser known German director who shot three of the Karl May Westerns, and some of the Edgar Wallace thrillers. Any violence? A few gun and fist fights, some blood. Fans of the series should enjoy this. The image is very good - some mild grain and great colours and detail. English mono. Sounds good, some noticable hiss in a few scenes. English - this track translates the English soundtrack, so there are some discrepancies when watching the German as the translations are different. Packing Only available in the Karl May Collection 2 boxset. Cuts? The film is believed to be fully uncut. Titles and credits are in German. An attempt to add some variation to the franchise makes this dark and interesting film worth watching. Find the other films in the Karl May Collection 2 boxset. All text in this review written by Timothy Young - 23rd November. 2006.